As the general spring turkey season comes to a close here in California, you still have a couple more weeks left if you want to bow hunt. The nice thing is that you won’t face much competition (from other hunters that is). That’s a good thing considering the challenge of finding these illusive bearded wonders, especially in the mountains. If you search the Internet, you’ll find a lot of high tech (I call it high maintenance) tactical advise on turkey hunting with a bow. First off, most of these guys have a lot of experience and a lot of great spots to hunt, which makes for nice videos. The truth is that most of us don’t have that luxury and have to work pretty darn hard to even get one turkey per season. Here in the mountainous foothill area of the Sierras, much of it comes down to being in the right place at the right time and getting a shot. Last year my hunting partner and I had a big gobbler come running full steam down the hill right as we were about to give up. I shot him with my 12 gauge and probably could have hit him with an arrow because of our persistence and patience. Our ancestors perfected traditional bowhunting and there is a lot of wisdom in their methods. Traditional bows were lightweight and could be fired in a split second. They also didn’t need to have a 70 pound draw, cams and $300 sights . Their tactics boiled down to excellent hunting skills — skills that often take second place to today’s technology. I bought a great little Samick Sage recurve for under 150 bucks and I love it! For another 70 bucks you can get an extra set of limbs (25 to 60 pounds) for various game. I have found that I have more options than a compound bow, especially when I’m moving around. After a month of practice, I could hit my 3D deer with deadly accuracy from a bunch of different locations and positions. It’s easy to carry in the woods and can be taken down in about a minute. So tactically speaking, you still have to have some decent turkey hunting skills if you want success. Locating and calling are vital and if you haven’t mastered these two techniques, it doesn’t matter what you shoot. And while I admit that a hunter with a great blind, an accurate compound bow and prime hunting spot has an edge over a guy sneaking around in the woods with a piece of wood, you can’t always depend on perfect conditions. There are a ton of variables. 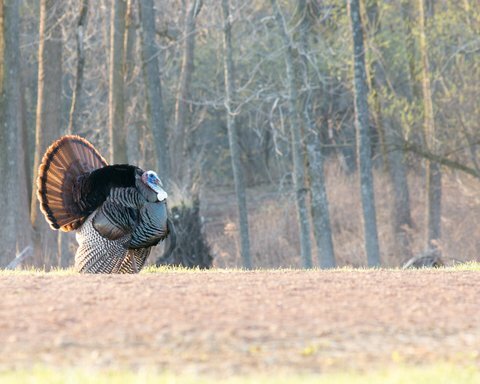 Much of turkey hunting (especially in the mountains) boils down to work and luck. What makes it exciting is when it all comes together and you can fall back on your skills, not your fancy gear. Learning how to hunt with a traditional bow is extremely rewarding and will improve all aspects of your hunting. And, if you’re patient enough to hunt turkey, you’ll no doubt have more respect for the ancient art of archery. So if you’re up to the challenge, grab an inexpensive recurve or longbow, some decent arrows and a few turkey targets—it’s actually pretty addictive! The great thing is that it develops great eye-hand coordination which will improve your accuracy no matter if you’re shooting a rifle, shotgun or even a slingshot. Who knows, you might even start wearing a loin cloth (which isn’t a great idea where there’s poison oak).